Al Jazeera television journalists Mohamed Fahmy, left, and Baher Mohamed, second from left, talk before hearing the verdict at a court in Cairo, Egypt, Aug. 29, 2015. Australian Al Jazeera journalist Peter Greste said Sunday the sentences handed down to him and his two colleagues on Saturday were "politically motivated." Greste said Egyptian President Abdel-Fattah el-Sissi "now has the opportunity to undo that injustice" and pardon the three journalists. An Egyptian court found all three journalists – Greste, Canadian national Mohamed Fahmy and Egyptian Baher Mohamed – guilty of supporting the banned Muslim Brotherhood and sentenced them to three years in prison. While Greste returned to Australia earlier this year, Mohamed and Fahmy remained free on bail in Egypt until Saturday when they were taken into custody. The U.S. State Department said it is "deeply concerned" by the verdict and urged Egypt to take all available measures to redress it. "The freedom of the press to investigate, report, and comment – even when its perspective is unpopular or disputed – is fundamental to any free society and essential to democratic development," the department said. Greste said there was "never any evidence that the court presented, that the prosecutor presented either in the first trial or in the second to confirm any of the allegations against us." The Australian said he would take advantage of "every legal, political, diplomatic and social means" to fight the charges. 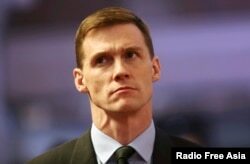 Meanwhile, Egypt has summoned the British ambassador because of comments he made about the case. Egyptian state media said Sunday Cairo objected to John Casson's comments, calling them "unacceptable interference." Casson had said he was concerned the verdicts could "undermine confidence in the basis of Egypt's stability, both in Egypt and aboard." He made the comments in Arabic to television cameras. Later, his statement was posted on the British embassy's Facebook page. FILE - British Ambassador to Egypt John Casson, shown at Saint Mark's Coptic Orthodox Cathedral in Cairo, Feb. 17, 2015. Mostefa Souag, Al Jazeera's media network's acting director, said in a statement Saturday, the verdict "defied logic and common sense." Nicholas Piachaud, Egypt researcher for Amnesty International, said the verdicts "represent the total crackdown on free expression we're seeing in Egypt today." He described the three journalists as "prisoners of conscience" and said, "We had hoped international pressure brought on Egypt would have resulted in their release." Judge Hassan Farid, in handing down the sentences, said the journalists had equipment that had not been approved by Egyptian security officials. The judge said the men were spreading "false news" and had used their hotel as a broadcasting center without permission. Marwa Fahmy, wife of Canadian Al-Jazeera English journalist Mohammed Fahmy, left, sitting with human rights lawyer Amal Clooney, bursts into tears as the verdict is read in a courtroom in Tora prison in Cairo, Egypt, Aug. 29, 2015. A verdict was originally expected earlier this month, but the court repeatedly delayed the proceedings since the three journalists were arrested in December 2013. "This is unjust. ... It cannot be allowed to stand. ... We are not terrorists," said Greste, who appeared on Al-Jazeera from Australia shortly after the verdicts were announced. Greste was freed in February. The verdict "sends a message that journalists can be locked up for simply doing their job, for telling the truth and reporting the news," said Amal Clooney, who represented Fahmy. "And it sends a dangerous message that there are judges in Egypt who will allow their courts to become instruments of political repression and propaganda," Clooney added. Al Jazeera's Souag said the journalists "have been sentenced despite the fact that not a shred of evidence was found to support the extraordinary and false charges against them. ... It is a dark day for the Egyptian judiciary, rather than defend liberties and a free and fair media they have compromised their independence for political reasons." The three men were convicted more than a year ago with a judge sentencing Greste and Fahmy to seven years in prison and Mohamed to 10 years. The Brotherhood has been the subject of a crackdown by the government of Egypt's Sissi since he led the ouster of former Islamist leader President Mohamed Morsi in July 2013. Many of the group's top leaders, including Morsi, have been arrested and convicted in mass trials. The United States is among many countries who have said Egypt had unjustly imprisoned the journalists.